I realize that this map is very hard to read. It comes from a website called Range Magazine. It is the map of the United Nations goal for the habitation of America. The only parts of the map that will be allowed to be used as places to live by ordinary citizens are the green portions. Notice that there is not a lot of green on this map. 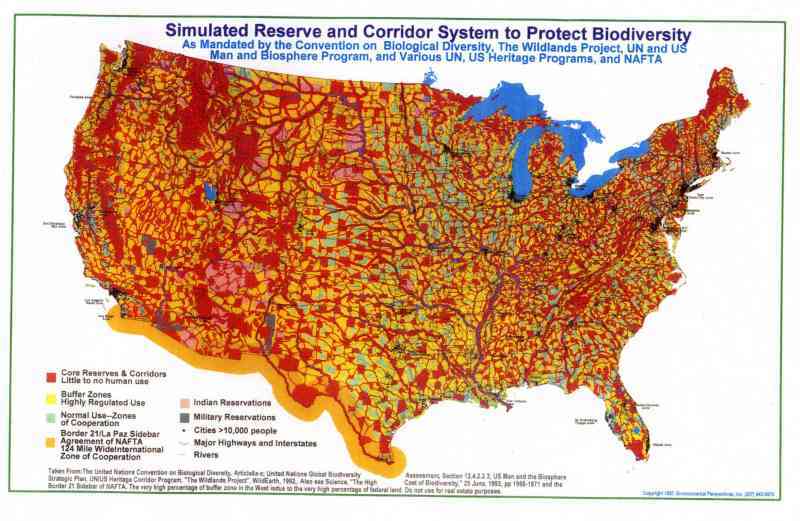 On June 29, 1994, the Senate Foreign Relations Committee approved the ratification of the Convention on Biological Diversity (Biodiversity Treaty) by a vote of 16 to 3. Only Senators Helms, Pressler, and Coverdell voted no. Three months later, on September 30, Senate Majority Leader, George Mitchell, for the second and final time, withdrew the Convention from the Senate calendar. The Treaty was never voted on, and now languishes in the bowels of government awaiting the arrival of a more friendly Senate. The defeat of the Treaty in the 103rd Congress came as a stunning victory for the private property rights and natural resource providers community, and was an astonishing defeat for the administration and its army of environmental organizations which had carefully orchestrated what it thought was certain ratification. The events that led to the defeat of the Treaty have been grossly misreported by the environmental community and by the main-stream press. Here is an accurate account of the events as they occurred, compiled from the records of many of the people who were in the forefront of the battle. For years I have listened to Rush Limbaugh state that the environmental movement was the new home of the Communists and Socialists who have been politically defeated in the last one hundred years. Investigating Agenda 21 and its related tentacles has convinced me that he is right. All Americans need to be aware that many of the freedoms we take for granted are under attack by our local, state, and federal governments.